These stepped dogbone filler caps, researched and reproduced by Vintage MG Parts, comprise a 2 piece component plus sprung loaded internals, just like the original factory cap. Please note that whilst the cap in the above picture is ours, the full lock should be at the '5 past 7' position as opposed to the '10 to 4' position shown above. This is due to the incorrect neck orientation on the tank in the picture which is not one of our tanks. 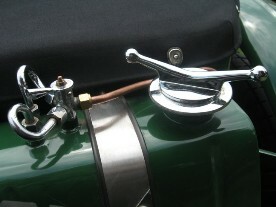 As we understand, the dogbone filler cap has not been remanufactured in it's correct configuration since the 1930's. Hybrid caps have however, been the only ones available to date and are recognisable as a single casting with several visual differences. These being a flat top (as opposed to stepped), the shorter length of the dogbone arms which are cranked, diameter of the balls, coarse knurl, parallel as opposed to funneled underside to the neck and the locating lugs to the neck are machined instead of pressed. The set of dogbone internals includes large and small cones, conical spring, split pin tie and nitrile gasket.